Tulsa had been mentioned as a possible future city for WNBA expansion, but efforts did not come together until the middle of 2009. An organizing committee with Tulsa businesspeople and politicians began the effort to attract an expansion team. The group was originally given a September 1 deadline. WNBA President Donna Orender extended that deadline to sometime in October. The investment group hired former University of Arkansas head coach Nolan Richardson as the potential franchise general manager and head coach. Richardson was a local favorite; before his successful 18-year stint at Arkansas, he had spent five years as head coach at the University of Tulsa, leading them to the NIT title in his first year. This move was viewed as strange by some, considering that Tulsa had not even secured a franchise before hiring a coach. The investors claimed it was to show the league they were serious about wanting a team. On October 15, 2009, the group made its official request to join the league. On October 20, 2009, WNBA President Donna Orender, lead investors Bill Cameron and David Box, Tulsa mayor Kathy Taylor, Oklahoma governor Brad Henry, and head coach Nolan Richardson were present for a press conference announcing that the Detroit Shock would relocate to Tulsa. 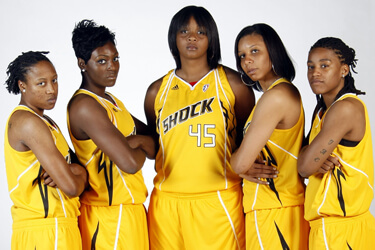 On January 23, 2010, the franchise announced that the team will remain as the Shock. The colors are now black, red, and gold.